Har Ki Dun is famously known for it's valley of Gods thus for its mythological existence. Pampered with the vibrant fauna, the place is full of orchid, rhododedrons and much more. Post the summers, the place becomes a green heaven when the pearls decorate the green foilage and makes it second to none. The Beautiful valley of Har Ki Dun is situated in the western range of Garhwal Himalayas. It is lies under Uttarkashi district of Uttrakhand in India. 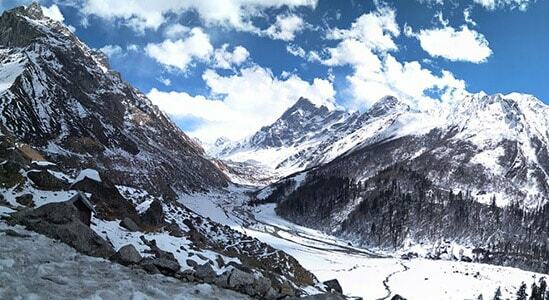 A winter paradise and trekker delight, Har Ki dun Valley is a Stairway to wonderland. One thing differ this trek from other is that you can trek here on summer and winter both and its beauty will amaze you in each winter. It will take you through most charismatic alpine meadows, Pine forest and Glaciers which is a treat to the eyes. Some believe that it is the same route taken by the Pandavas in Mahabharata to ascent heaven. 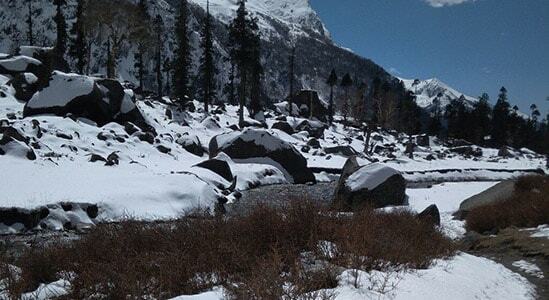 The Har Ki Dun trek will take you through some of the most ancient villages that are approx. 2000 years old. This trek is perfect for adventure seeker and nature lover. You can even spot various species of bird and capture pics for lifetime memories. Motivate an opportunity to observe the different types of flying creatures and warm blooded animals that flourish in this locale. You can likewise detect various langoors close Puani Garaat. This support molded valley is loaded up with old towns that are around 3000 years of age. Likewise, not simply observe the excellence of the district, inspire an opportunity to meet the nearby individuals and find out about their everyday life. While on the trek you will likewise observe numerous ponies and cows nibbling at the knolls and waterway banks. This trek is paradise for nature sweethearts, experience searchers and furthermore shutterbugs. Catch a portion of your most ideal chances while you take off for this trek. Invigorate yourself with some tea each morning before you take off for the trek. One who has an experience of trekking can do it quite easy and it isn’t even hard for the first timers but can get little tiring while trekking, Har ki dun trek difficulty level can be overcome by anybody with a decent fitness. Har ki dun with beautiful master creation could be the most magnificent and incredible journey for the trekkers on Har ki dun trek route. Is it suitable for children’s? Yes, the trek is favorable for children’s up to 5 years of age but there are certain additional logistical support that we recommend for children’s. Is it a good option for the first time trekkers /or families? Yes, we recommend for those who have a less or no prior experience in trekking , this trek does not have tricky patches, and a well planned itinerary will not making it tiring and uncomfortable for you to trek. Maximum altitude of Har ki Dun trek is 11,768 Ft. One can attain it with subject to his endurance and other conditions such as a climate, temperature which use to be a bit unrecognizable while trekking in Uttarakhand. The trek lasts for 8 days including pickup and return, if it is booked with us. This is a valley trek where you trek along the Supin River to Har Ki Dun valley. Since the trekking trail isn’t treaded upon too often, birds and animals thrive in this region. One can spot langoor families near Puani Garaat. Black bears, wild boars, and Barasingha are few of the other animals you can spot if you’re lucky. Golden eagles and massive Himalayan griffins also live here. The colorful Himalayan Monal, the state bird of Uttarakhand, thrives in the forests here. The Har ki Dun trail takes you back in time. The cradle shaped valley is populated with ancient villages that are over 3,000 years old. This is also one of the few treks where one can come across the local lifestyle in close proximity. Most of the residents here grow rajma, potato, and rice for a living. They also weave their own wool and make jackets and coats. You can get an intimate look into the lives of villagers as they pass you by. The Har Ki Dun trail assumes a different complexion during the months of October and November. Here is a gallery of its lush, green landscape. You will spot horses and cows grazing in the meadows and on the sprawling river banks makes Har ki dun one of the best treks in India. The valley does not just have the essence of an amazing trek but the valley according to Hindu mythology is another way that Pandavas took while walking towards the heaven via Swargarohini, a mountain massif in the Saraswati range of the Garhwal Himalaya. It lies in the Uttarkashi District of the northern Indian state of Uttarakhand. Har ki dun valley gives you the panoramic view of the Mother Nature; the cradle shaped valley signifies peace and serene beauty and describes Nature in an ultimate way, each step you take while trekking in the magnificent valley allows you to get the feeling of paradise in the lap of Himalayas specially in summers cause Har ki dun trek best time is April to Nov. Har ki dun valley is the only valley from where one can witness the Swargrohini 1, 2, 3, Bandar Poonch, black peak and Ruinsara peak from here Nature never skip the chance to amaze the humanity. The indigenous native of the Har ki dun trek in Himalayas is an example of how beautifully they are taking care of nature and ironically how city life is destroying nature at the same time. Har ki dun valley is populated with the ancient villages that are over 3,000 years old; locals of Har ki dun valley mainly worship Duryodhana as it is believed that the valley was the home of the worrier Bhog Dat who was a Kaurava supporter and that is why it is among few places where people worship Duryodhana. Read our more Har ki dun trek Blog in ‘Blog’ section where you’ll get different aspects of beauty at there. Sankri base camp can be reached in 8 to 10 hours from Dehradun. You can take a cab from Dehradun railway station at 6:30 in the morning, Sankari is small village with almost 250 houses but the beauty of the village is so much more the village cponsist some small shops and dhabas, the village is also a trekking route for many trails likr Kedarkantha, Barsu pass etc. Morning in sankari is not less than a amazing experience one can have, the swaargrohini peak which is visible with the sun shines bright looks like a fairy tale. Altitude: 6,397 ft. to 8,280 Ft. via 8,694 Ft.
Time Taken: 6 hrs, 10 Km. A cab will take you from Sankri to Taluka which is 12 Km. in distance and will take around 1 Hour to reach. Here you have to trek to Reach Puani Garaat, Taluka, a small village has concrete houses from there we will trek to Punani garaat where in between you will cross the river and wooden bridge that is going to remind you about the ancient time, as the essence of past is still alive in mountains, walking ahead you will witness harvest fields of potato, millet, and maize will fall on the way giving the whole stretch a ranch house feel. Pauni Garaat, a green clearing on the banks of Supin at its sprightly best is arrived at late in the afternoon as the Sun begins to dip you will reach your destination that is Punani Garaat. Altitude: 8,280 Ft. to 8,956 Ft.
Time taken: 6 hrs, 7 Km. Start your day by trek heading to Osla town. Osla is a tiny town. After Hiking for an hour you will enter in a series of cleared land. The Climb is large after it however beautiful landscape makes up for the efforts, You will soon reach flat land, which is your next Campsite, Kalkatiyadhaar., the trail passes through 3 garaat or hydroelectricity run teasing units which are utilized by the villagers for isolating husks of millet and maize pursued by establishing to flour. The unspoiled vibe held in the encompassing, the trek continues through gather lands, dairy cattle eating, and inclination roofed cabins utilized as silo and stockpiles. In the wake of intersection a log connect, the trail turns for a rising. On this slope, you will motivate remarkable perspectives to take looks of the Dhauladhar Range out front. Twisted trails to Borasu Pass and Baspa Valley can likewise be made out from here. The high trail twists further down achieving a tabletop green stretch—Kalkattiyadhar. This is the campground for day 2. Altitude: 8,956 Ft. to 11,768 Ft.
Time taken: 5 hrs, 4 Km. Water sources: You can refill your drinking water bottles from the lake along the trail. 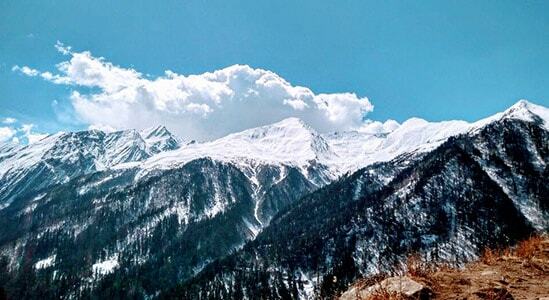 While you cross the hill, you will be welcomed with the sight of Har ki dun Peak. Below is Har ki dun Valley. The Campsite is only 4 Km away from Pine woodlands and meadows. When you reach Har ki dun you will be amazed by its beauty. Explore Maninda Taal from Har Ki Dun base camp. Altitude: 11,768 Ft. to 8,280 Ft.
Water sources: You can refill your water bottles from the waterway along the trail. Trek Gradient: Easy. Trek back on the same route that you came by. Begin trek early as you have to cover long distance today. Take a Rest at Osla and proceed onwards to Puani Garaat, Camp at Puani Garaat. Altitude: 8,280 Ft. 8,690 Ft. to 6,397 Ft.
Trek 13 Km. to Taluka, Then a drive from Taluka to Sankri. The path back to Sankri is simple. It will take 10–11 hrs, drive from Sankri to Dehradun. This is a valley trek where you trek along the Supin River to Har Ki Dun valley. Since the trekking trail isn’t treaded upon too often, birds and animals thrive in this region. One can spot langoor families near Puani Garaat. Black bears, wild boars, and Barasingha are few of the other animals you can spot if you’re lucky. Golden eagles and massive Himalayan griffins also live here. The colorful Himalayan Monal, the state bird of Uttarakhand, thrives in the forests here. The Har ki Dun trail takes you back in time. The cradle shaped valley is populated with ancient villages that are over 3,000 years old. This is also one of the few treks where one can come across the local lifestyle in close proximity. Most of the residents here grow rajma, potato, and rice for a living. They also weave their own wool and make jackets and coats. You can get an intimate look into the lives of villagers as they pass you by. The Har Ki Dun trail assumes a different complexion during the months of October and November. Here is a gallery of its lush, green landscape. You will spot horses and cows grazing in the meadows and on the sprawling river banks. Har ki dun valley gives you the panoramic view of the Mother Nature; the cradle shaped valley signifies peace and serene beauty and describes Nature in an ultimate way, each step you take while trekking in the magnificent valley allows you to get the feeling of paradise in the lap of Himalayas. Har ki dun valley is the only valley from where one can witness the Swargrohini 1, 2, 3, Bandar Poonch, black peak and Ruinsara peak from here Nature never skip the chance to amaze the humanity. The indigenous native of the Har ki dun valley is an example of how beautifully they are taking care of nature and ironically how city life is destroying nature at the same time. Begin with a target of completing a distance of 5 Km. in 45 min and then gradually increase it to 7 Km. in the same time and remain stick to this practice until you are able to cover 10 Km. in 80-90 min without fail, at a stretch. The trek expense of Rs. 8,900 + 5% GST takes care of all expenses of the trek from Sankri to Sankri. What is the average Har ki Dun temperature is? The temperature of Har ki Dun trek in winter’s remains 4°C to freezing cold in the night. While on summer the temperature remains from 18 °C to 7 °C. Why is it called Har ki Dun trek? When you visit this place you will realize why it is called Har ki Dun just by looking at its view. The whole valley is covered with snow. Why Har ki Dun trek is famous? Har Ki Dun Trek: A doorway to ancient Himalayan villages. 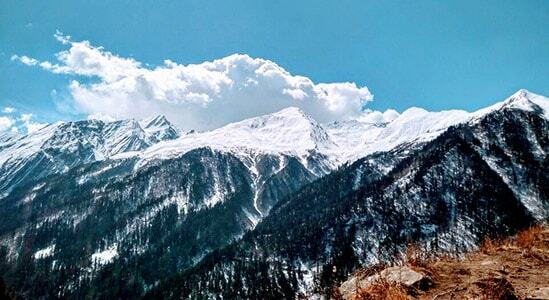 Har Ki Dun is one of the most beautiful valleys in the Western Himalayas. 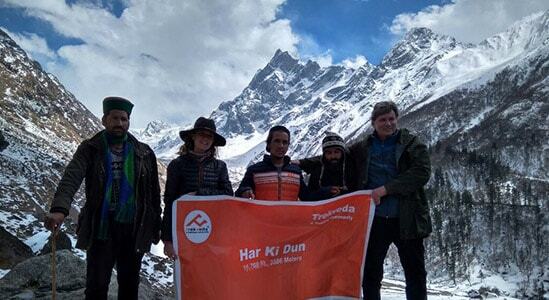 What is the height of Har ki Dun Trek? The Har ki Dun height varies with every phase you pass as your approach the Har ki Dun trek, you will acclaim a height of around 3500 m.
What will be the base camp of Har ki Dun trek? 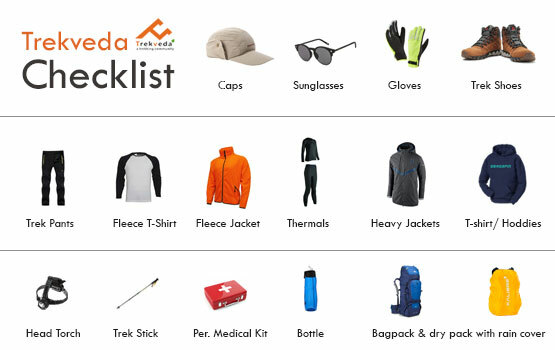 Trekveda makes it's basecamp at Sankri. Yes, you can take your child on Har ki Dun trek, but the age limit is above 12 year. 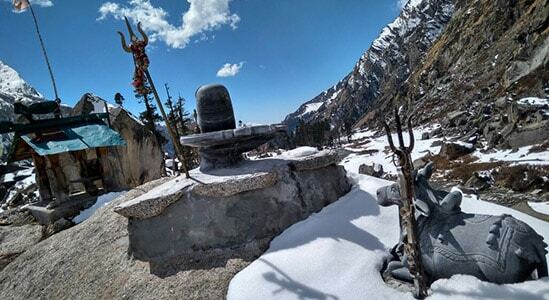 The best season to see the snow on Har ki Dun trek is the January and February where you can see a lot of snow-clad you can also witness the fresh snowfall at heights if the climate is favorable but if you’re planning to see the snow at large then the Last week of January and first week of February is best. Har ki Dun trek is considered as easy to Moderate trek which can be done by anyone, who is fit to trek. The sloppy ice treks on Har ki Dun trek make it difficult to walk. You can’t risk taking the preparation for physical strength prior to trek for granted as it may cost you losing your best trek experience. The total expenses of the trek will be INR 8,499/- per person. In addition to that, an addition of 5% of the GST will be levied on the total cost.